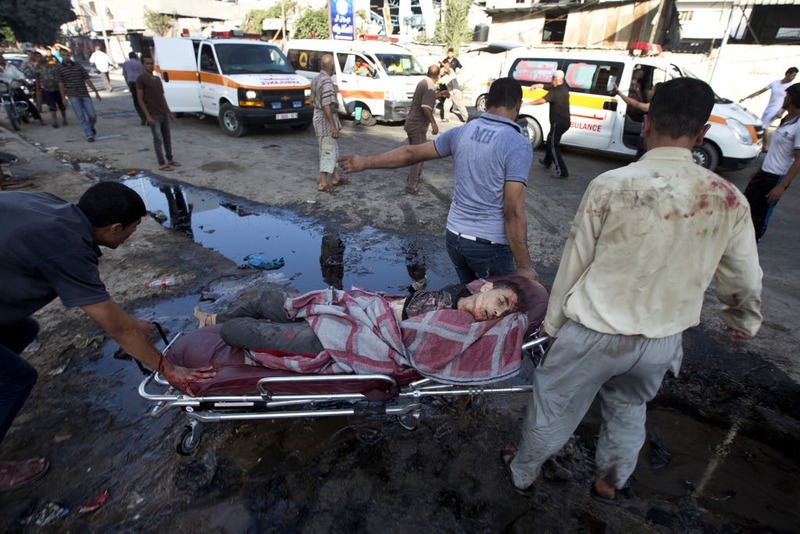 Nora Barrows-Friedman: Dr. Mona, can you tell us about the situation in Gaza right now, especially after the latest Israeli missile strikes overnight and the massacre at the Shujaiya open market earlier today? Dr. Mona El-Farra: Yes, actually, this day in the morning, the first massacre happened when the Israelis attacked one of the schools in the Jabaliya refugee camp, where twenty at least were killed and tens were injured. I lost track of numbers, but for sure the killed were twenty. 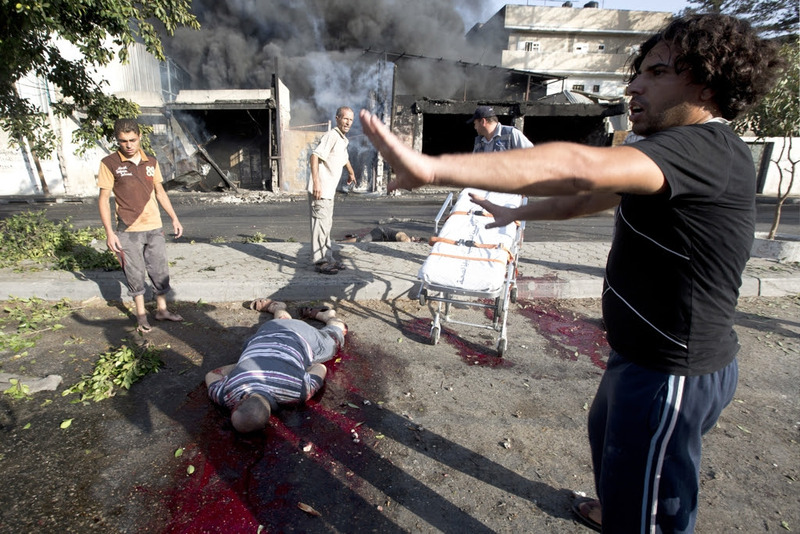 And before that, there was heavy, heavy shelling for two or three hours, then this massacre happened. 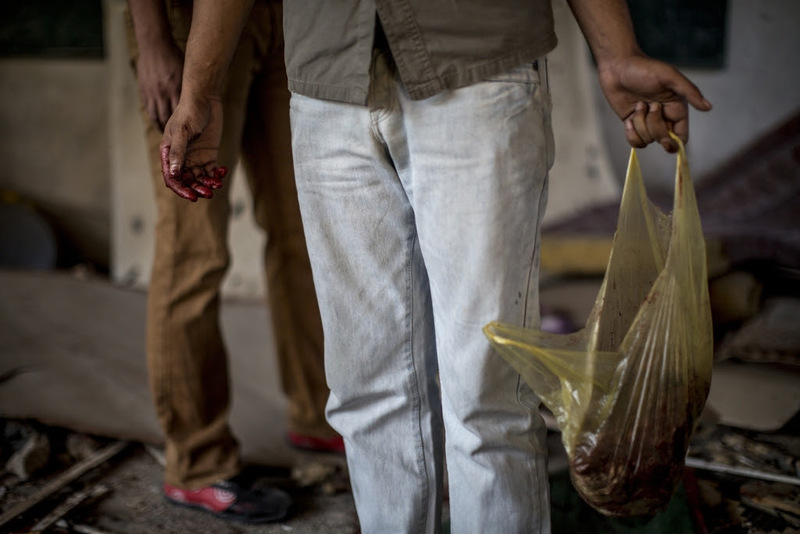 Then, in the middle of the day, at the Shujaiya market, when people felt safe that there was a humanitarian ceasefire, people went to shop for a few things. 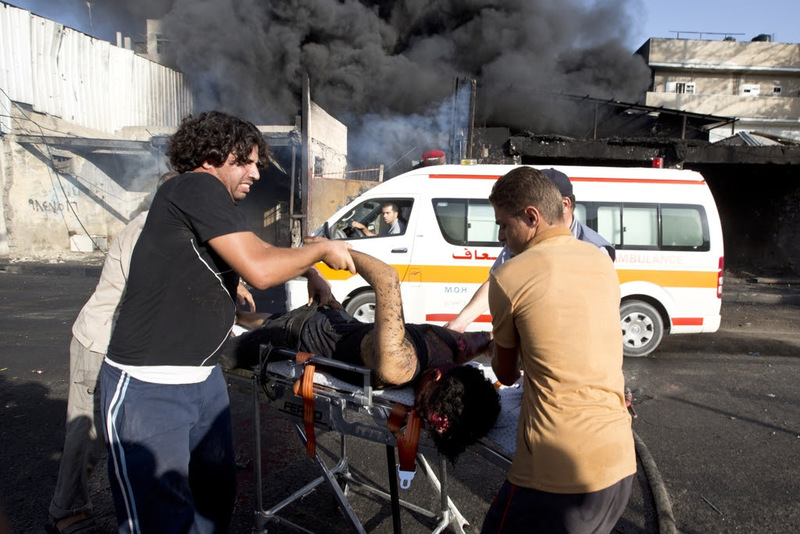 And then they were attacked again by missiles, by the Israeli army, and seventeen at least were killed, maybe 200 were injured, and a big, big fire stayed for maybe one hour, you could see the smoke from the other end of town. Two of the health workers, emergency health workers, died in that attack too, as well as one journalist. The situation is really very, very bad. And we have a big problem at the moment at the hospitals and medical facilities, which are in shortage of medications because the burden is high. The main hospital in Gaza, al-Shifa hospital, is receiving immediately 200 cases, the injured with different sorts of injuries. It is a big burden, it was mass casualties with a lack of essential medication and supplies, that’s why there was an appeal on the radio when this happened asking people to go to the hospital to donate blood. And we don’t have power at the moment. We don’t have water. And when we don’t have power, the generators at the hospitals will start to not function well. So an imminent humanitarian health problem is coming soon if this continues. For us, for me, working at the Red Crescent Society in the Gaza Strip, which is partnered with the Middle East Children’s Alliance, we receive every day an increasing number of patients coming from the schools, people who took shelter in the schools or with their relatives. There are very bad health conditions, and increasing numbers of infectious diseases like gastroenteritis, upper respiratory tract infections and skin diseases. We are not used to this great number of patients daily, we receive between 200-250 patients coming and asking for health consultation at our center. Again, we have a diagnostic center, and the hospital, al-Shifa hospital, their equipment like the CT [scanner] has stopped working, so we receive cases at our center. Every day we receive an increasing number of injured who are in need for diagnostic procedure like the CT.
Today, I came across three cases coming for a CT. Three cases with head injuries. The first one, her name is Buthaina el-Izraia, she came to our diagnostic center with a head injury and many shrapnels all over her body besides the head injury. This was the first case. The second story -- a child, three years old, and the name of this child is “Anonymous number six.” He came with a head injury as well. And you understand why he was “Anonymous” -- that means the child has lost its whole family, and they couldn't determine who the child is. Another case, her name is Reem Ahmad, again with a head injury, from Nuseirat refugee camp, six years old. And again, she lost all the members of her family. These stories are common already in Gaza, but it attracted my attention -- a human being called “Anonymous number six.” Or a woman, a peaceful woman trying to plant her flowers, trying to normalize an abnormal life, and then the result is to be hit with a head injury. And I don’t know if they will make it or not. After they come to our center, they go back to the hospital to resume their treatment. Another story — one of our staff, she is a nurse, her name is Afaf Hussein, and this morning I heard that her daughter was killed with her three grandchildren and two of her children. I tried to call her phone several times and she couldn’t answer the phone. Her daughter was one of our volunteers a few months ago in our center. We are surrounded with death. We are surrounded with horror. We are surrounded with a lack of facilities and we try hard to help people, we try hard to help each other, but the burden is heavy and the attack is very serious, and this should stop now. NBF: What does it mean for Palestinians in Gaza to be cut off from the outside world because of the electricity crisis, as well as being cut off from family members and loved ones and neighbors as the phone networks are going down? ME: This is another disaster, because this is our lifeline to the outside world. For me, on a personal level, by the end of the day when I come home, I start writing. I feel that I am still alive. I still can convey the message. And not only that, we feel that maybe something worse is happening and Israel wants to hide this, to keep us isolated from the world, so nobody knows what crimes are going to happen next in Gaza. It is frightening. It is frightening. WASHINGTON (Reuters) - The United States has allowed Israel, waging an offensive in the Gaza Strip, to tap a local U.S. arms stockpile in the past week to resupply it with grenades and mortar rounds, a U.S. defense official said on Thursday. The munitions were located inside Israel as part of a program managed by the U.S. military and called War Reserves Stock Allies-Israel (WRSA-I), which stores munitions locally for U.S. use that Israel can also access in emergency situations. Israel, however, did not cite an emergency when it made its latest request about 10 days ago, the defense official said, speaking on condition of anonymity. The United States allowed Israel to access the strategic stockpile anyway to resupply itself with 40mm grenades and 120mm mortar rounds to deplete older stocks that would eventually need to be refreshed. "They didn't ask for it from there but we gave it to them so we could rotate our stocks," the official said. Additional Israeli requests for U.S.-manufactured ammunition were also being processed in the United States, the official said. The official did not offer further details on quantities or costs of ammunition already supplied or requested. Israel's embassy in Washington declined comment about the resupply request, including whether it asked for the ammunition because of its operations in Gaza. Separately, U.S. lawmakers were working in Congress to provide millions of dollars in additional funding for Israel's "Iron Dome" missile shield. The U.S. Senate Appropriations Committee added $225 million for Iron Dome to a spending bill intended mainly to provide money to handle an influx of thousands of Central American children across the U.S.-Mexico border. 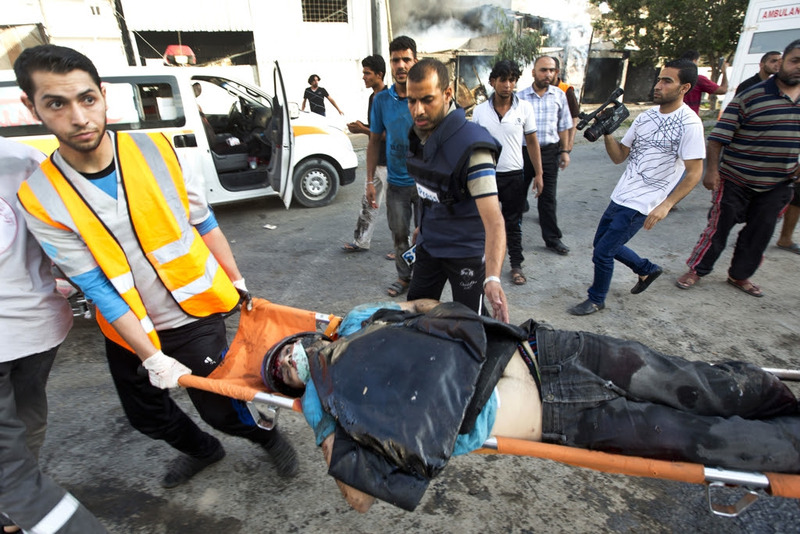 According to the Gaza Health Ministry, 1,346 Palestinians, mostly civilians, have been killed since Israel began its offensive on July 8 with the declared aim of halting cross-border rocket fire and destroying the tunnel network of the Islamist group Hamas. 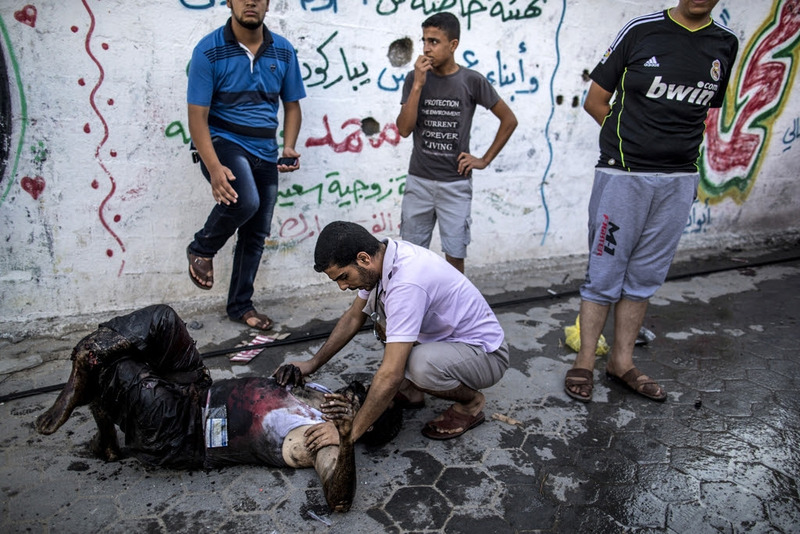 On the Israeli side, 56 soldiers and three civilians have been killed. Thanks Tom, I'm following these terrible events through your blog every day. This is all shocking and sad -- haven't seen any pictures until these, these two days on your site. Thanks for keeping things (all too) real . . . . The children's eyes; incomprehension, trauma. Many thanks friends, always extremely consoling to hear such conscious voices. And yes -- "terrible", "shocking", "incomprehensible", "traumatic"... terms from a historical vocabulary, certainly applicable in this awful present, for all too many suffering human beings. But one does wonder: will the horror that's happening with the world's passive permission in Gaza now ever become officially received as history, when what passes as history has become nothing more than the convenient triumphalist narrative of the power-playing of the few?